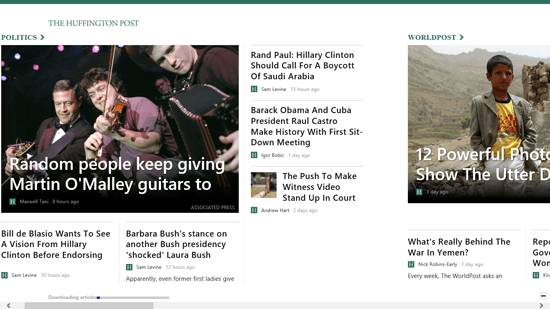 The Huffington Post is a free news app for Windows 8 and 8.1 computer. The app is for real time news feed, it syncs with the official website of The Huffington Post and presents you with the latest news updates on various topics of news. The Huffington Post is a famous news aggregator and blog that was founded in 2005 by Arianna Huffington and others. The news app of The Huffington Post is natively developed by the The Huffington Post itself. The website was founded as a political weblog. The Huffington Post’s news app features news under the genres of politics, world post, business, entertainment, style, health, taste, travel and technology. Each category or news genre gets updated in seconds to show the latest updates of the news without any kind of delay. You can manually click on the refresh button to reload the news feed. 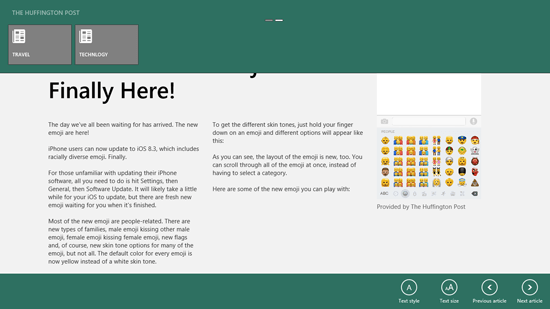 The app has clean interface and scrolls in the native Windows sideways parallax mode. The news feed of the categories shown on the dashboard has a big tile of image with the news below it. Along with it you can see up to 5 news articles with the snippet below each of them. This is same for each news category shown on the dashboard. When you click on a news item, it open the article on the screen of your Windows 8 and 8.1 computer wide and let you scroll if it has large content. The menu on the The Huffington Post’s news app can be toggled by right clicking anywhere on the screen. In the menu you can see different news categories on the top of the screen in a green bar. The menu options for the article includes text style, text size, previous article and next article. You don’t have to go back to see the next or previous article as it can be done with the help of the menu.